Marc, I am watching your Entertainment Center Video (Pt 1) and noticed something odd with your large chisel. How did you flatten the back of it? It looks like there are three channels cut into it. The chisels I use on the show (most times) are Fujihiro Japanese chisels. In general, Japanese chisels are made with harder steel than their Western cousins, which means it can take a lot longer to flatten their backs. And a flat back is an absolutely critical component to any chisel you actually intend to use! So to speed up the flattening process, a good amount of steel is removed from the back of the chisel. And as you can see in the picture, wider chisels can have multiple hollows. So now the actual amount of steel that needs to be removed in the flattening process is significantly reduced. Which means you are going to spend less time at the sharpening stone, and more time at the workbench. This is the same concept behind creating a hollow bevel. Many folks prefer hollow bevels because they can be easier to sharpen, not just because of speed, but because its easier to balance with two points of contact. FYI, some may disagree with me on this but this is just my opinion from my experience. So the hollows are a little unusual-looking, but they do serve a purpose. I borrowed the image to the right from a great article on FineWoodworking.com called “Speedy Freehand Sharpening” by Hendrik Varjhu. Domino DF500 vs Domino XL DF700 – Which is Right for Me? I guess the chisels are no good after you sharpen your way back to hollows? So how long until that happens? Well, probably a very very long time. But if it does happen, you can always flatten the back again to re-expose new steel and create some distance between the edge and the hollows. 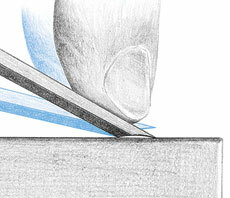 From what I’ve read and seen in chisel sharpening videos (Norton’s for example), the extremely flat portion is only required near the cutting edge so you can get the truly flat and sharp edge. The rest of the back just needs to be pretty flat. I guess that is mainly needed if you are paring. A true paring chisel is actually somewhat convex on the flat side. This allows you better control so the chisel doesn’t dig into the wood. But this kind of paring chisel is hard to find these days. Most of mine were made around the turn of the 19th century–back when all professional woodworkers still used hand tools. You can usually find the old chisels cheap at any flea market. And if they haven’t been sharpened down too far, will still cut with the best of the modern chisels. Plus you can often find them in odd sizes. In my shop I routinely use 1/8″ and even 1/16″ chisels. I have a set of 5, from 6mm to 42mm. They are awesome but they sure are expensive! With those hollows on the back could they make it harder to register your chisel against a surface if you were per say paring something off? Only if you are paring something very skinny or very close to an edge. But for 99% of paring operations, it works just fine. Hard to sharpen too. You can’t just touch them up on a grinder, or give them a few swipes on a stone. But they hold an edge for a good long time. The steel is usually a lamination–with very hard steel on the flat side, combined with soft iron or steel on the body of the chisel. Supposedly gives you a blade that will hold an edge, but won’t break. In practice, I find them fairly easy to chip. But great for careful, fine work where you want a sharp tool. They don’t replace my western chisels, but make a nice addition to them. I have a few chisles that I have mostly avoided using. In August I used a chisel for the first time. I was mortising an installed door. Two owners ago a DIY’er lived her and let’s just say finish carpentry was not his thing. Because NOTHING was finished. Anyway, I learned a great lesson that day, I grasped the door below where I was using the chisel and did not break the fibers first, three stiches and my dremel later I fixed the door. Last week I used a chisel successfully to reapir some chip out on a work peice I routed. Thanks to Marc’s how to in the holiday pencil box episode. So Be careful just because it does not plug in does not mean you can not hurt yourself! Amen, I had two stitches in the left palm with my chisel. I didn’t clamp the material down and was trying to hold the wood like an idiot. Lesson learned. Wow!! Those are some REALLY expensive chisels. I have no doubt that they are worth it though. Hey Marc, Can you recomend a decent set of chisels that the average guy can afford? Google “Japan Woodworker” and have them send you a catalog. They carry the widest range of Japanese chisels and their catalog is full of information about them. Grizzly recently released a line of nice chisels. They have been reviewed quite favorably and they are fairly inexpensive, compared to the higher-end brands. I have a Woodriver set and they’re OK for starter chisels. But if I had to do it again, I think I’d buy the Grizzly chisels. But its not the same exact set I have now. Not sure if they use the same steel these days. I’ve always admired Japanese Chisels. Here’s a short 4 minute commentary on Japanese Chisels. I’ve read a lot about them on the web, and how they’re made, and the different types, but it would be nice to find a comprehensive document on these chisels. Hey Marc have you ever heard of the Belmont Tool Steel or CE Jennings chisels? I’ve got a friend who’s’ father passed away and she was planning on giving me her dads chisels as a Christmas gift. I was just wondering if you knew or if you had a good online resource for looking up old tools. I assume they are old. She said that some of the tools go back as far as her great grandfather. Hey everybody here is a new one for you. I’m on the island of Okinawa right now until about July or August, and I want to visit as many woodworking sites as possible. Cabinetshops, galleries of fine woodworking, old school toolmakers, architecture, etc. Whatever it may be called, I want to see Okinawan/Japanese fine woodworking. I really want to take home as a souvenir a Japanese woodworking tool, preferrably a chisel. Anybody have any ideas? I’ll post this question in other places as well to maximize its exposure and chances of a favorable response. I’ll take pics, do a writeup, share my experiences and everything, I just need to be pointed in the right direction. don’t worry about sharpening past the hollow. #1 the back of the chisel doesn’t get run on the rough stones like the bevel, just polish it. 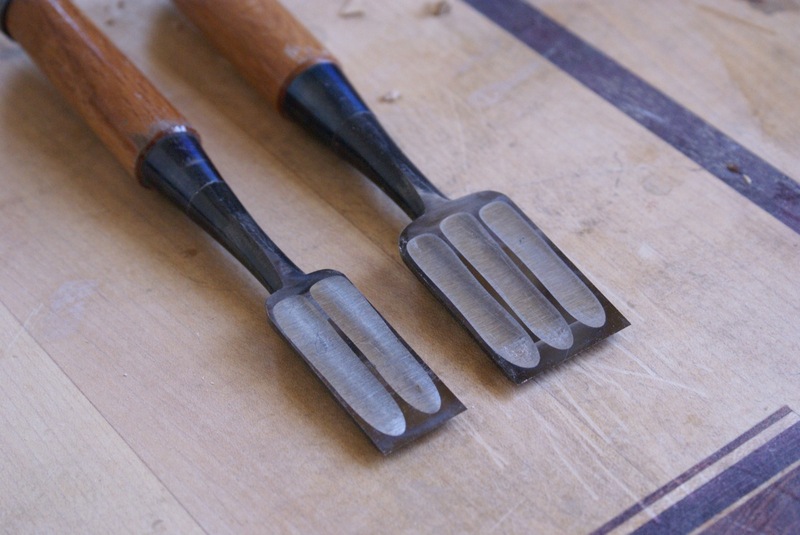 #2 look at google images of used chisels and you will see them used down to the nub. no kiddin, there will be 1/4 inch of blade left and they love it that way.